Bashir Lazhar opens March 14th! 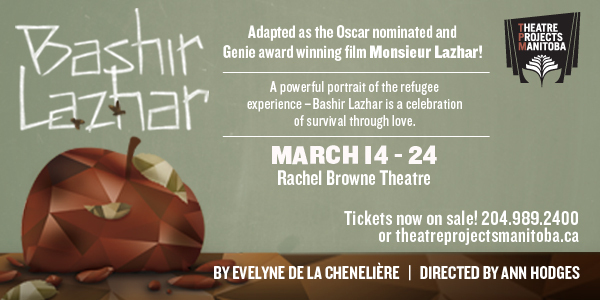 This week we kicked off rehearsal’s for Bashir Lazhar at the Crescent Fort Rouge United Church! On Monday, February 18th, the full Artistic Team gathered in the warm & sunny 2nd floor space that will be witness to the delicate process of building this new production of Evelyne de la Chenelière’s acclaimed play. Our intrepid team includes director Ann Hodges, actor David Adams and stage manager Ivory Seol. Our Design team brings together Joan Murphy Kakoske (sets & costumes), Hugh Conacher (lights) and Chris Coyne (sound). We huddle around the table with our coffees and notebooks and feel the crackle of excitement through introductions. The design models and drawings are passed around the table so that we can all peer excitedly into the mini stage spaces. When the first read finally begins, David’s resonant voice and physical bearing makes our hearts skip. The conversation is focussed, and Ann speaks about the power of the poetic aspects in de la Chenaliere’s beautiful play. We see that this crack team of artists will create stage magic!